Endometrial cancer is the fourth most common cancer affecting women in the UK, and the most common gynaecological cancer in the developed world. The incidence of this malignancy has risen by approximately 40% over the past 20 years – which has been attributed to an increase in obesity during this time period. In the UK, the peak incidence of endometrial cancer is between 65 and 75 years of age, although ~5% of women affected are under the age of 40. In this article, we shall look at the risk factors, clinical features and management of endometrial cancer. 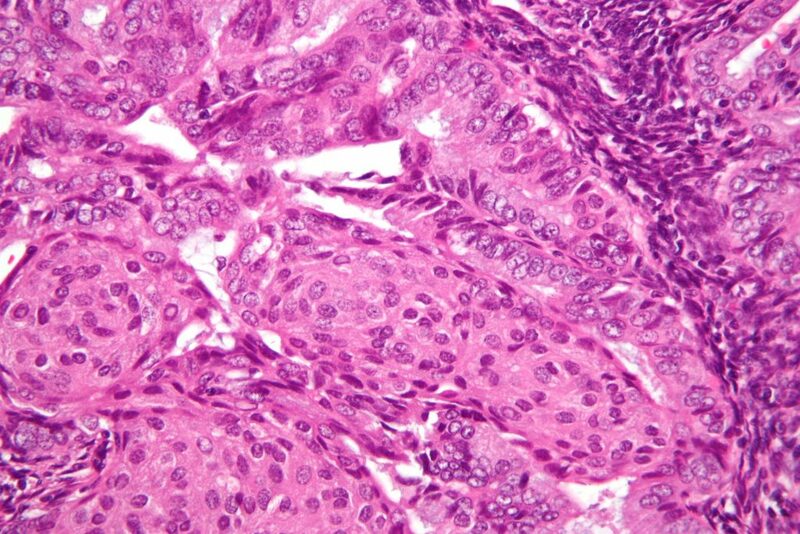 The most common form of endometrial cancer is adenocarcinoma, a neoplasia of epithelial tissue that has glandular origin and/or glandular characteristics. Most cases of adenocarcinoma are caused by stimulation of the endometrium by oestrogen, without the protective effects of progesterone (termed ‘unopposed oestrogen’). Progesterone is produced by the corpus luteum after ovulation. Scenarios in which women may have experienced a longer period of anovulation are thought to predispose to developing malignancy. Unopposed oestrogen can also cause endometrial hyperplasia. This in itself is not malignancy, but can predispose to atypia, a precancerous state. Fig 1 – High magnification micrograph of endometrial adenocarcinoma. Early menarche and/or late menopause– at the extremes of menstrual age, menstrual cycles are more likely to be anovulatory. Low parity – just under 1/3 of women developing endometrial cancer are nulliparous. With each pregnancy, the risk of endometrial cancer decreases. Polycystic ovarian syndrome – with oligomenorrhoea, cycles are more likely to be anovulatory. Hormone replacement therapy with oestrogen alone. The peak incidence of endometrial cancer is between 65 and 75 years. Prior to the age of 45, the risk of endometrial cancer is low. Approximately 40% of endometrial cancer cases are thought to be linked to obesity. The greater the amount of subcutaneous fat, the faster the rate of peripheral aromatisation of androgens to oestrogen – which increases unopposed oestrogen levels in post-menopausal women. Genetic conditions that predispose to cancer, such as hereditary non-polyposis colorectal cancer (Lynch syndrome), are a risk factor for developing endometrial cancer. The majority (75-90%) of women with endometrial cancer present with PMB. However, this is also a non-specific symptom – 90% of women with PMB do not have endometrial cancer. Uncommonly, postmenopausal women with endometrial malignancy may present with clear or white vaginal discharge, or with abnormal cervical smears. Endometrial cancer can also rarely develop in premenopausal women, and may cause irregular bleeding or intermenstrual bleeding. Advanced or metastatic endometrial cancer may manifest with abdominal pain or weight loss. Abdominal examination – for abdominal or pelvic masses. Speculum examination – for evidence of vulval/vaginal atrophy, or cervical lesions. Bimanual examination – to assess the size and axis of the uterus prior to endometrial sampling. Vulval causes – vulval atrophy, vulval pre-malignant or malignant conditions. Endometrial causes – hyperplasia without malignancy, benign endometrial polyps, endometrial atrophy. 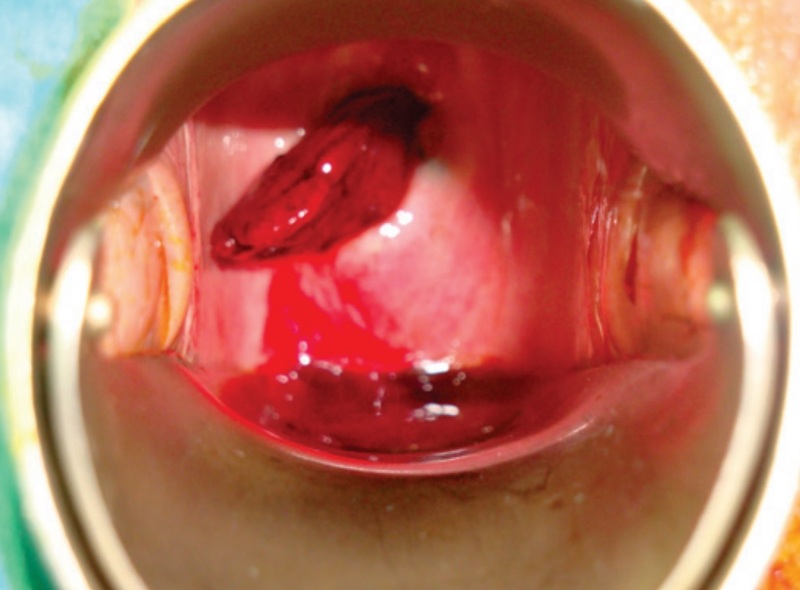 Fig 2 – A vascularised haemorrhagic mass protruding through the external cervical os. This is a giant endometrial polyp – a differential diagnosis in cases of post-menopausal bleeding. A transvaginal ultrasound scan is the most widely used first-line investigation. 96% of women with endometrial cancer will have an endometrial thickness of >5mm on ultrasound. If an endometrial thickness of >4mm in a postmenopausal woman is identified, an endometrial biopsy should be obtained. This can be performed at an outpatient appointment, often with a Pipelle biopsy. Histology from the biopsy can confirm the presence of hyperplasia, with or without atypia, or malignancy. If the gynaecologist deems the case high risk, such as with heavy bleeding, multiple risk factors or very thickened endometrium on ultrasound (or the patient is unable to tolerate outpatient sampling), hysteroscopy with biopsy may be performed – either as an outpatient or under anaesthetic. If the endometrium is <4mm and appears normal on ultrasound, it is reasonable to defer endometrial sampling as the risk of cancer is low. However, if they continue to have abnormal bleeding then sampling may be indicated. If malignancy is confirmed, an MRI or CT scan may be used for staging. Prior to any operative intervention, baseline bloods including FBC, U&Es, LFTs and a Group and Save sample should be taken. Stage I – Carcinoma confined to within uterine body. Stage II – Carcinoma may extend to cervix but is not beyond the uterus. 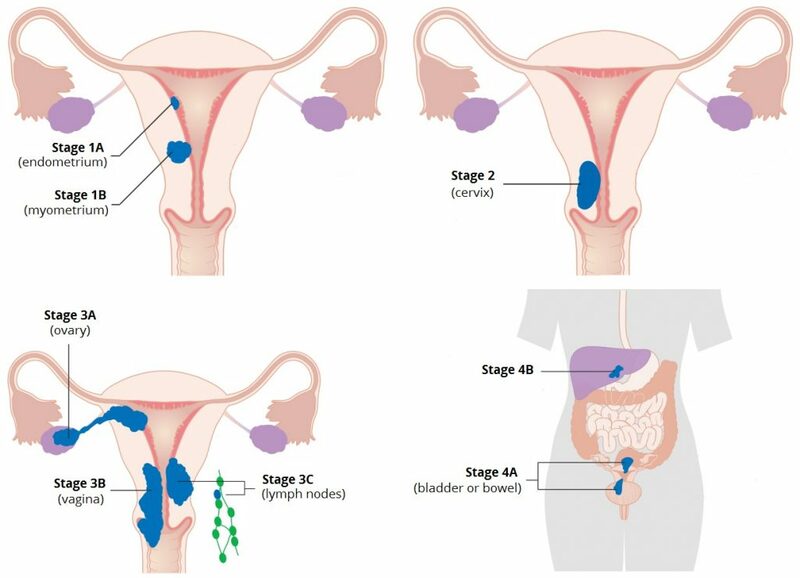 Stage III – Carcinoma extends beyond uterus but is confined to the pelvis. Stage IV – Carcinoma involves bladder or bowel, or has metastasised to distant sites. Non-malignant ‘simple’ or ‘complex’ hyperplasia without atypia can be treated with progestogens e.g Mirena IUS. Surveillance biopsies should be performed to identify any progression to atypia or malignancy. Atypical hyperplasia, which has the highest rate of progression to malignancy, should be treated with total abdominal hysterectomy + bilateral salpingo-oophorectomy. If this surgery is contra-indicated, regular surveillance biopsies should be performed. Stage I – Total hysterectomy and bilateral salpingo-oophorectomy. Peritoneal washings should also be taken. Traditionally, this has been performed as an open procedure, but laparoscopic surgery is increasingly performed. 75% of women present with stage I disease, and this has a very good 5-year survival rate of 90%. Stage II – Radical hysterectomy (whereby vaginal tissue surrounding the cervix is also removed, alongside the supporting ligaments of the uterus), and assessment and removal of pelvic lymph nodes (lymphadenectomy). Women with confirmed carcinoma stage Ic or II may be offered adjuvant radiotherapy. Additional chemotherapy is usually given prior to radiotherapy. In many stage IV patients, a palliative approach is preferred, e.g. with low dose radiotherapy, or high dose oral progestogens. A recurrence of treated carcinoma is possible, and so frequent follow up is required up to 5 years post-operatively.